Corpus Christi is the great feast of Jesus’ presence among us. In the year of faith (2013) we wanted to give it special importance. 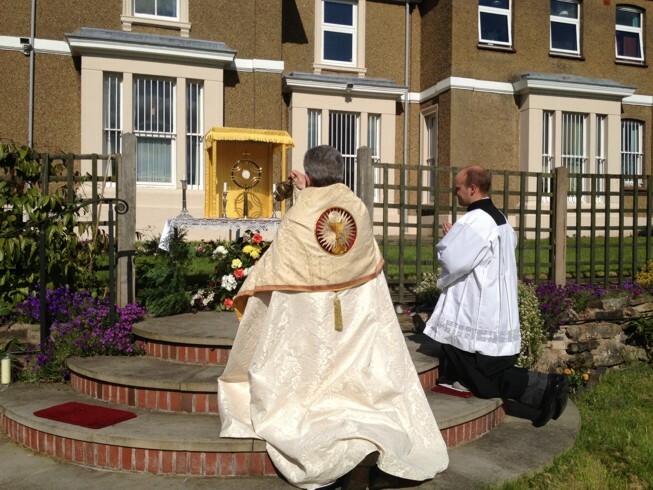 We thus celebrated it with a day of Eucharistic adoration, inviting as many of our friends as possible to join us. 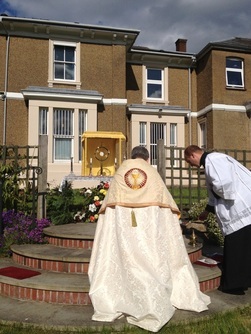 At the end of the day, as an expression of our joy, we had a Blessed Sacrament procession around our grounds and then Benediction at an outdoor altar. In this way, we were united in spirit with our Holy Father, Pope Francis, who was at that time carrying the Blessed Sacrament in procession through the streets of Rome. Every day in Carmel, we spend two hours of silent prayer sitting or kneeling before the tabernacle, absorbing the power of Christ's love, in order to pour it out upon the world through intercessory prayer. In this way, we become channels of God’s love and mercy. 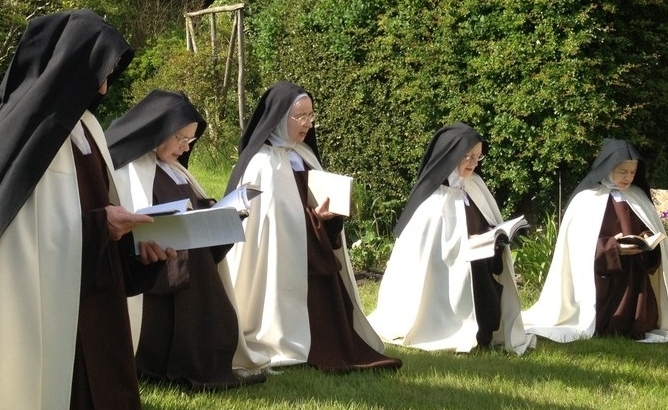 Friendship with Jesus is the ‘inner spring’ that nourishes the life of a Carmelite. In the man Jesus, we see the face of God made present. We become more fully human through devotion to Him. He is our companion, our way to the Father. It is proper for the Catholic Church to have a feast day in honor of the body and blood of our Lord and Savior, Jesus Christ. Jesus shed His blood on the cross so that the sins of many could be forgiven. Anyone who understands this will eat of His flesh and drink of His blood to have eternal life, as Christ once taught. Jesus said to them, “Very truly I tell you, unless you eat the flesh of the Son of Man and drink his blood, you have no life in you. Whoever eats my flesh and drinks my blood has eternal life, and I will raise them up at the last day. For my flesh is real food and my blood is real drink. Whoever eats my flesh and drinks my blood remains in me, and I in them. Just as the living Father sent me and I live because of the Father, so the one who feeds on me will live because of me. This is the bread that came down from heaven. Your ancestors ate manna and died, but whoever feeds on this bread will live forever (John 6:53-58). The believer who eats of Christ's flesh and drinks of His blood has eternal life. What a wonderful promise from the true Son of God and Savior of the World!